Hi all, this app store optimization checklist that I’ve assembled represents a really big part of the information I’ve been able to find – and test much of it – about ASO. Optimizing your app to be found organically through the app store search functionality is a really important step to take to get the downloads your app deserves. According to research done by Forrester, app store searching accounts for 63% of app discovery. That means, incase you don’t want to do the math, a majority of apps are found, and subsequently downloaded, by being searched for on the app store. That also means, again with the math, 37% of app discoveries are through outside marketing efforts – ads, SEO, social sharing – so don’t think you can optimize your app page and get straight to number 1. ASO is really just to ensure that any marketing you use results in higher download rates after the campaign has finished – or you move onto your next project. Well, there you have it. A really great start for your ASO endeavors. I do want to add one note to the end of this though. I really glossed over the app usage and retention block. The thing you need to keep in mind about this; even though Apple and Google do look at these metrics to see if your app is worth ranking higher, even if they didn’t look at this you need to spend some serious time on this part. You need to make your app totally freaking awesome if you want to actually make money with it. People don’t use apps that don’t work. They don’t tell their friends about apps that don’t work. And if they do, it will come back to haunt you. So before you put the time into getting your app in front of more people, test the heck out of it. Don’t release something onto the store that is substandard. Before you can really rise in the charts, you MUST have an awesome app. So take the time and resources necessary to get the UX top notch. And don’t underestimate the power of updates, I have gotten emails from people who weren’t sure if they should download my app, because it had been a few months since the last update. If I had one person email me about this concern, there were countless others who just didn’t bother to even try the app. Your updates don’t need to be huge bug fixes or content upgrades – though bug fixes should be a high priority, and content upgrades are nice and keep people happy. They don’t even have to be a change in your code, just a new version number – though I’ll bet you can always find some small thing to actually update, even if it is just tweaking your analytics code. I would suggest updating at least every couple of weeks. If you like the infographic and want to share it, I have included below some code you can copy and paste into the HTML of your site. Or share this post on your favorite social media site. Or you can contact me for possibly a guest post about it. Last, but not least, did I miss anything? Any glaring errors you are just itching to tell me about? 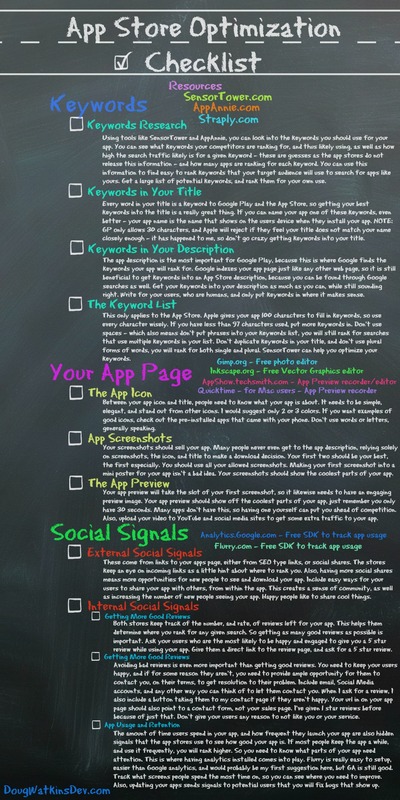 Or is there some cool information about my app store optimization checklist infographic that feel you need to share with the world. Do so in the comments – or shoot me a tweet @iOSDoug.